How could I pass up a chance to be Julia Roberts on the movie, “Pretty Woman” for a day? I remember watching this movie when I was little with my mom and ever since then I have been on the hunt for the perfect polka dot dress. I tried my best to transform the infamous 1990’s outfit to more of a modern day, minimal look with a sleek leather jacket and hair in a low bun. I had no idea that I would be one to purchase a brown colored dress. I don’t think I own any brown clothing to be honest. It’s just not the most flattering color to wear but when you throw in some polka dots here and there, it’s automatically chic. I can’t wait to add more browns to my collection. I hope more people hop on this trend because it’s so unique. Not only is the color of this dress out of my comfort zone but the low back feature is a whole ‘nother story. I NEVER buy anything with a low back because that just means finding a bra to wear them with. I’d rather be comfy and wear my normal bra than be uncomfortable in a back baring ensemble. I decided to take the risk and purchase this dress anyway because why not. I think I was so drawn to the fact that it reminded me so much of “Pretty Woman” I was blinded by the low back. I found a sticky bra (that’s surprisingly comfortable) and all my problems were solved. I don’t think you understand how satisfied I feel knowing that I own a brown polka dot dress. Feeling like a pretty woman in this dress is a understatement…that’s for sure. More polka dot dresses! HERE. HERE. HERE. Wow! I like this outfit so much! 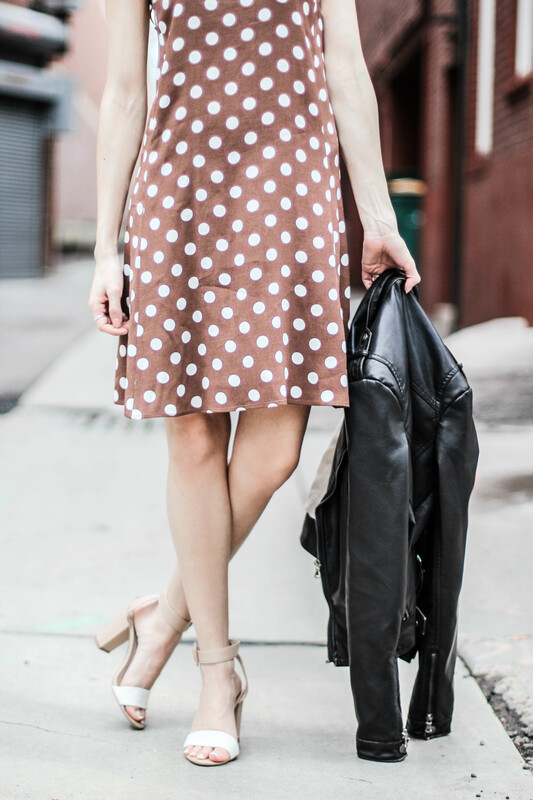 Polka dress looks perfect on you! And I always love the fact that your outfits are so simple yet amazingly stylish!